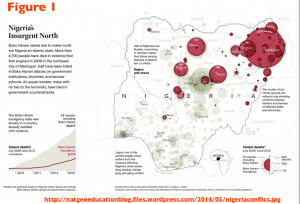 Is Poverty the Root Cause of Boko Haram Violence? The notion that poverty is the main cause of terrorism and insurgency is one of the most contentious ideas in global security studies. Those on the left tend to emphasize the connection between violence and the lack of development, while those on the right tend to deny or at least minimize it. My own tendency is to distrust any simple, single “root cause” explanation for just about anything, as most problems are complex and stem from multiple lines of causation. Overall, the evidence indicates that poverty in itself does not generate terrorism or any other form of political violence, just as it shows that ferocious extremism can take root in relatively affluent social environments. But that said, poverty can exacerbate tensions, and in so doing contribute to the problem. Whether or not it does so and to what degree, however, are empirical issues that need to be examined afresh in each particular situation. At the global scale, blanket statements about economic “root causes” tend to obscure rather than clarify the analysis. To begin to address the purported linkage between Boko Haram and poverty, we therefore need to investigate the geography of development in northern Nigeria. In doing so, we are hampered by the lack of quality data, and as a result the following analysis must be regarded as tentative. Yet it is clear that northern Nigeria is a deeply impoverished place, having experienced much less social and economic development than the still-poor southern third of the country. But Boko Haram is not a “northern Nigerian” organization; rather, it is based in the northeastern corner of the country. 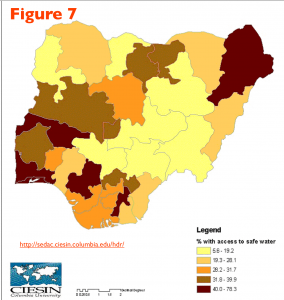 The central question is thus whether Borno State in the northeast is a particularly deprived part of Nigeria. To address this question I have assembled a number of economic and social-developmental maps of the country, which allow the comparison of Borno with the rest of northern Nigeria as well as with the rest of the country at large. To begin the analysis, I created a map of per capita GDP (PPP) by state in Nigeria, as none were readily available on-line. As can be seen, the economic division between the mostly Christian far south and the heavily Muslim north is fairly stark. 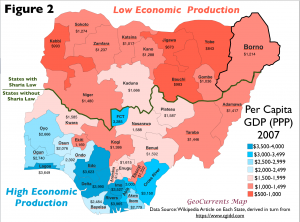 But Borno, highlighted on the map, is far from the country’s least economically developed state; significantly lower production figures are encountered in relatively peaceful Jigawa and Kebbi states, and figures similar to that of Borno are found in some states of the south. GDP, however, is often a poor indicator of relative deprivation, as it tells us nothing about the distribution of wealth. 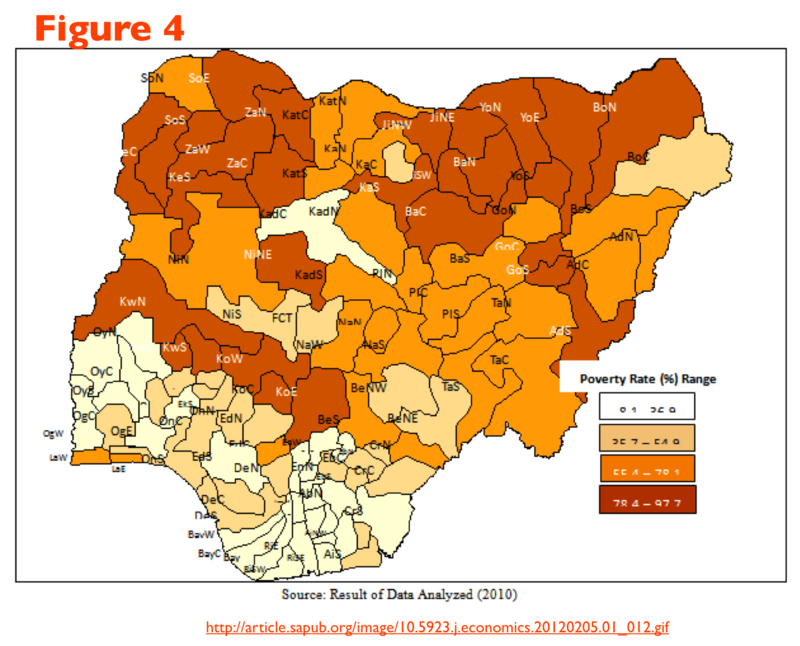 Nigerian economic data, moreover, are not particularly trustworthy. I have therefore found a variety of additional maps, made by other researchers, that can help elucidate the situation. 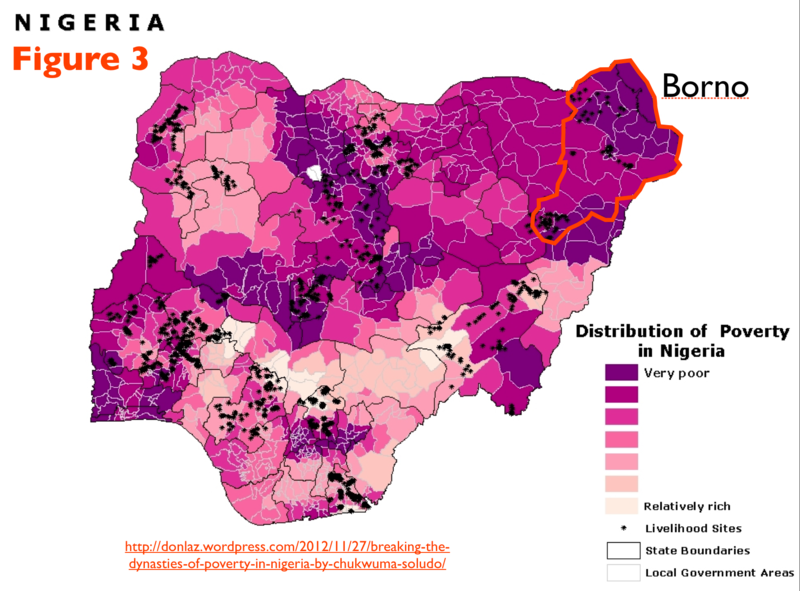 Several of these maps indicate entrenched poverty across all or at least much of Borno, as can be seen in Figures 3 and 4. 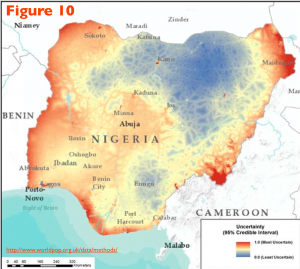 Other studies, however, came to very different conclusions; Figures 5 and 6, for example, indicate that Borno is relatively well off when compared with the rest of northern Nigeria (although figure 6 is quite dated). Some studies of specific aspects of development have come to similar conclusions. A Columbia University project (Figure 7), for example, determined that in regard to safe drinking water—a key developmental indicator—Borno stands at a higher level than most of the states of southern Nigeria. Studies of childhood malnutrition and stunting (Figure 8), on the other hand, place Borno at a lower level of social development than southern Nigeria, but still show it as suffering less deprivation than relatively peaceful areas in northwestern Nigeria. 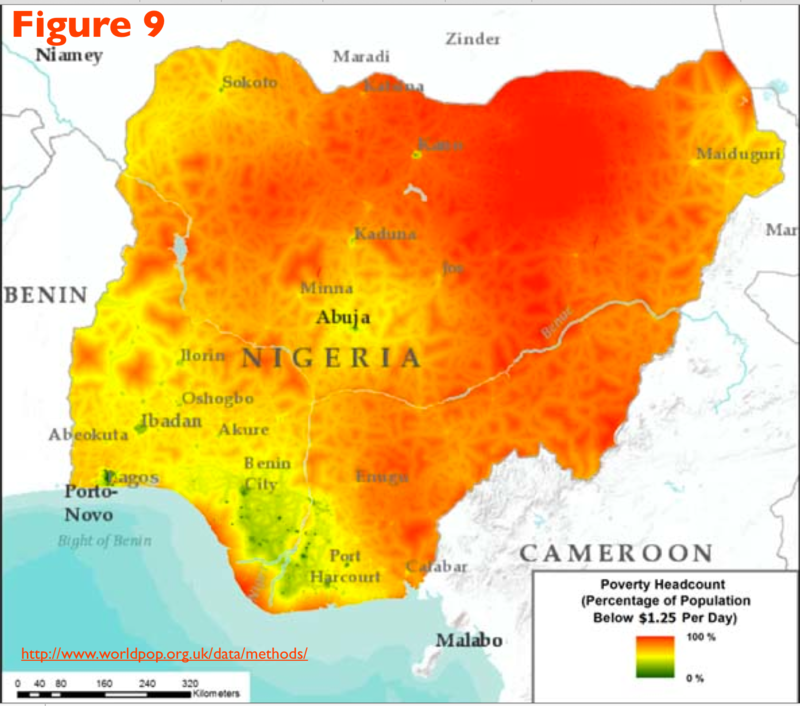 In brief, GPS located national household survey data were obtained through either the Demographic and Health Surveys (DHS) program or the Living Standards Measurement Study (LSMS) program and either $1.25 and $2 a day consumption-based poverty metrics or the Multidimensional Poverty Index (MPI) were calculated for each survey cluster. A Bayesian geostatistical modeling framework, following approaches constructed for the Malaria Atlas Project was then established to exploit spatiotemporal relationships within the data, leverage ancillary information from an extensive set of covariates, and rigorously handle uncertainties at all stages to generate robust output surfaces with accompanying confidence intervals. 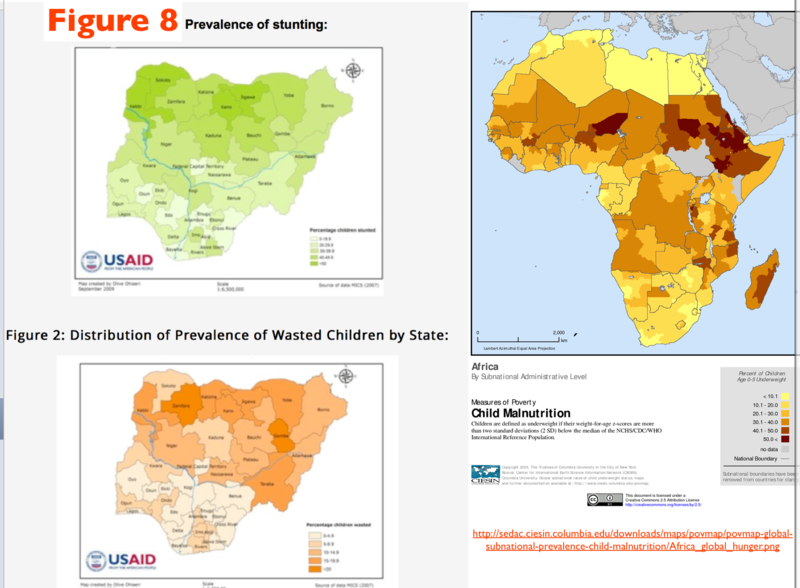 The figures below show example outputs for Nigeria, and further outputs can be found at www.fspmaps.com. Sophisticated Bayesian geostatistical modeling, however, does not necessarily ensure accurate results, as regular readers of GeoCurrents have seen in regard to historical linguistics. Be that as it may, this map does seem to be one of the better geographical representations of poverty in Nigeria. I am also impressed by the authors’ inclusion of an “accuracy map” of their own study. As can be seen here (Figure 10), northeastern Nigeria does falls into the zone of low confidence. 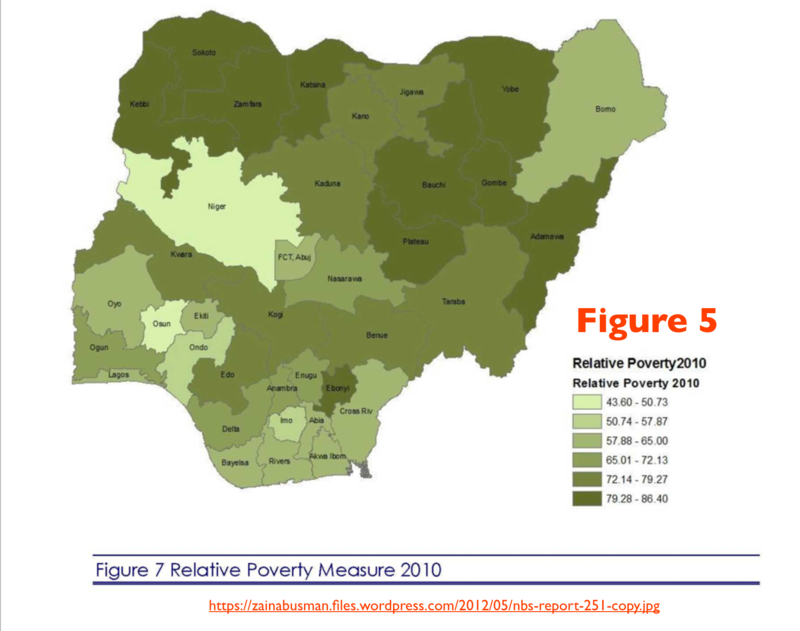 The information found in these various poverty maps of Nigeria tends to be inconsistent, perhaps indicating that the entire endeavor is pointless. On balance, however, I do think that we can tentatively conclude that Borno is not the poorest or least developed part of Nigeria. 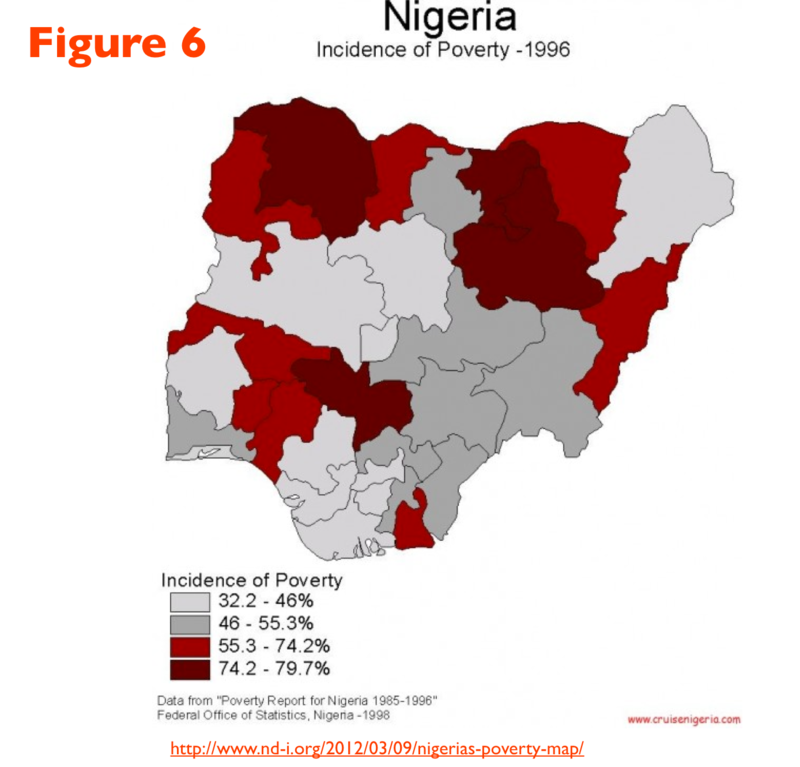 If poverty were the ultimate cause of extremist violence in northern Nigeria, we would expect such a movement to develop not in Borno but rather further to the west. It thus seems likely that Boko Haram’s extremism stems from a variety of factors rather than simply being rooted in social and economic deprivation. Some of these additional factors will be considered in a forthcoming GeoCurrents post.